2 0 1 8 • WRAPS • 75 COLOR CHART Universal Products, Goddard, Kansas, introduces its 2017 graphic film color chart, which offers a broad variety of spe- cialty graphic films for printing and sign cutting. Actual prod- uct strips of color and texture are displayed, not printed, for accurate selection of materi- als. This 2017 graphic film color chart displays eight pres- sure sensitive product groups. Uni-cal a premium and economical calendared vinyl has a palette of 31colors. Metalized specialty films have gold and silver patterns and shine. Reflective colors are designed for high visibility and weatherability. For information, visit www.u-p.com. 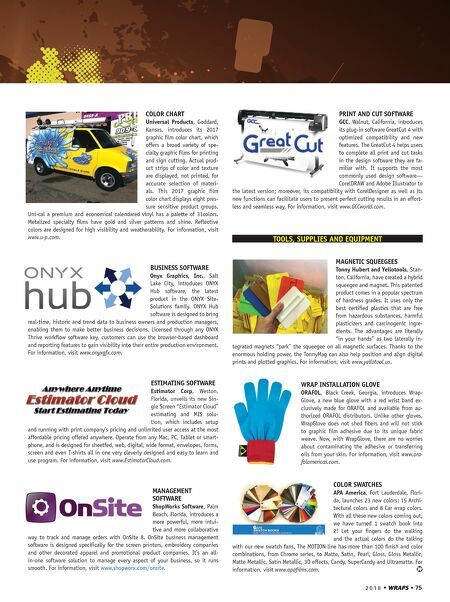 BUSINESS SOFTWARE Onyx Graphics, Inc., Salt Lake City, introduces ONYX Hub software, the latest product in the ONYX Site- Solutions family. ONYX Hub software is designed to bring real-time, historic and trend data to business owners and production managers, enabling them to make better business decisions. Licensed through any ONYX Thrive workflow software key, customers can use the browser-based dashboard and reporting features to gain visibility into their entire production environment. For information, visit www.onyxgfx.com. ESTIMATING SOFTWARE Estimator Corp, Weston, Florida, unveils its new Sin- gle Screen "Estimator Cloud" estimating and MIS solu- tion, which includes setup and running with print company's pricing and unlimited user access at the most affordable pricing offered anywhere. Operate from any Mac, PC, Tablet or smart- phone, and is designed for sheetfed, web, digital, wide format, envelopes, forms, screen and even T-shirts all in one very cleverly designed and easy to learn and use program. For information, visit www.EstimatorCloud.com. MANAGEMENT SOFTWARE ShopWorks Software, Palm Beach, Florida, introduces a more powerful, more intui- tive and more collaborative way to track and manage orders with OnSite 8. OnSite business management software is designed specifically for the screen printers, embroidery companies and other decorated apparel and promotional product companies. It's an all- in-one software solution to manage every aspect of your business, so it runs smooth. For information, visit www.shopworx.com/onsite. 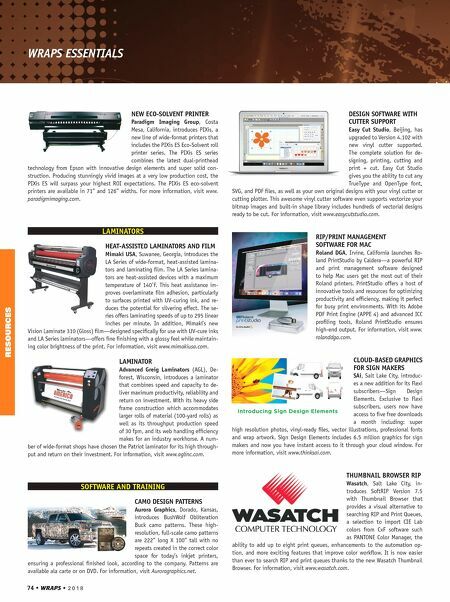 PRINT AND CUT SOFTWARE GCC, Walnut, California, introduces its plug-in software GreatCut 4 with optimized compatibility and new features. The GreatCut 4 helps users to complete all print and cut tasks in the design software they are fa- miliar with. It supports the most commonly used design software— CorelDRAW and Adobe Illustrator to the latest version; moreover, its compatibility with CorelDesigner as well as its new functions can facilitate users to present perfect cutting results in an effort- less and seamless way. For information, visit www.GCCworld.com. TOOLS, SUPPLIES AND EQUIPMENT MAGNETIC SQUEEGEES Tonny Hubert and Yellotools, Stan- ton, California, have created a hybrid squeegee and magnet. This patented product comes in a popular spectrum of hardness grades. It uses only the best certified plastics that are free from hazardous substances, harmful plasticizers and carcinogenic ingre- dients. The advantages are literally "in your hands" as two laterally in- tegrated magnets "park" the squeegee on all magnetic surfaces. Thanks to the enormous holding power, the TonnyMag can also help position and align digital prints and plotted graphics. For information, visit www.yellotool.us. WRAP INSTALLATION GLOVE ORAFOL, Black Creek, Georgia, introduces Wrap- Glove, a new blue glove with a red wrist band ex- clusively made for ORAFOL and available from au- thorized ORAFOL distributors. Unlike other gloves, WrapGlove does not shed fibers and will not stick to graphic film adhesive due to its unique fabric weave. Now, with WrapGlove, there are no worries about contaminating the adhesive or transferring oils from your skin. For information, visit www.ora- folamericas.com. COLOR SWATCHES APA America, Fort Lauderdale, Flori- da, launches 23 new colors: 15 Archi- tectural colors and 8 Car wrap colors. With all these new colors coming out, we have turned 1 swatch book into 2! Let your fingers do the walking and the actual colors do the talking with our new swatch fans. The MOTION line has more than 100 finish and color combinations, from Chrome series, to Matte, Satin, Pearl, Gloss, Gloss Metallic, Matte Metallic, Satin Metallic, 3D effects, Candy, SuperCandy and Ultramatte. For information, visit www.apafilms.com.